Passed away peacefully 25.3.2019, aged 93. Beloved wife of Harvey (dec). Loving Mother of Ann and Steven. 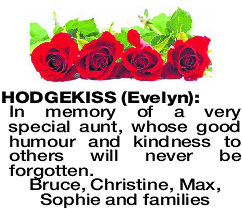 The Funeral Cortege for Mrs Evelyn Hodgekiss of Bicton will arrive at the main entrance of PINNAROO Valley Memorial Park, Whitfords Avenue, Padbury at 10.30am on WEDNESDAY (3.04.2019) for a Cremation Service. 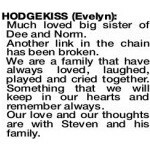 Much loved big sister of Dee and Norm. Another link in the chain has been broken. We are a family that have always loved, laughed, played and cried together. Something that we will keep in our hearts and remember always. Our love and our thoughts are with Steven and his family. A beloved sister, we are now all reunited. 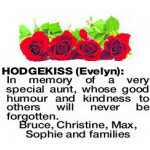 HODGEKISS EVELYN In memory of a very special aunt, whose good humour and kindness to others will never be forgotten. 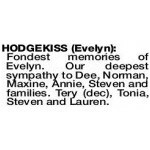 In loving memory of my dear cousin Evelyn. Deepest sympathy to her loved ones. 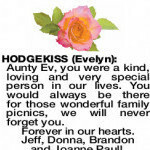 Aunty Ev, you were a kind, loving and very special person in our lives. You would always be there for those wonderful family picnics, we will never forget you. Forever in our hearts. Jeff, Donna, Brandon and Joanne Paull. 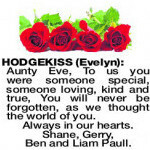 HODGEKISS EVELYN Aunty Eve, To us you were someone special, someone loving, kind and true, You will never be forgotten, as we thought the world of you. Always in our hearts. Shane, Gerry, Ben and Liam Paull. 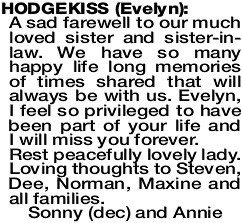 A sad farewell to our much loved sister and sister-in- law. We have so many happy life long memories of times shared that will always be with us. 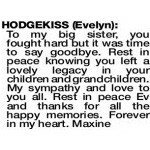 Evelyn, I feel so privileged to have been part of your life and I will miss you forever. 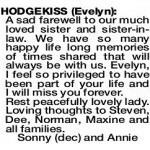 Loving thoughts to Steven, Dee, Norman, Maxine and all families. 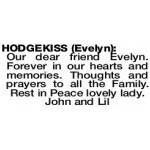 Fondest memories of Evelyn. 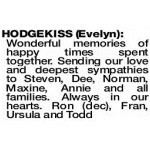 Our deepest sympathy to Dee, Norman, Maxine, Annie, Steven and families. Tery (dec), Tonia, Steven and Lauren. 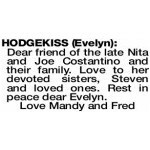 Dear friend of the late Nita and Joe Costantino and their family. 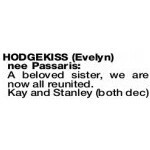 Love to her devoted sisters, Steven and loved ones. 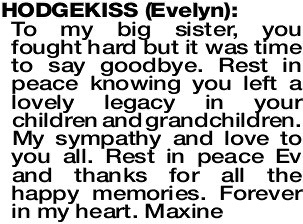 Rest in peace dear Evelyn. Happiest memories of our fun times together and wonderful family gatherings. Her selfless compassion for others was infinite.